One pristine Valley, Eight Friends and Wild Ice. Austrialpin / Social / Blog / DetailOne pristine Valley, Eight Friends and Wild Ice. 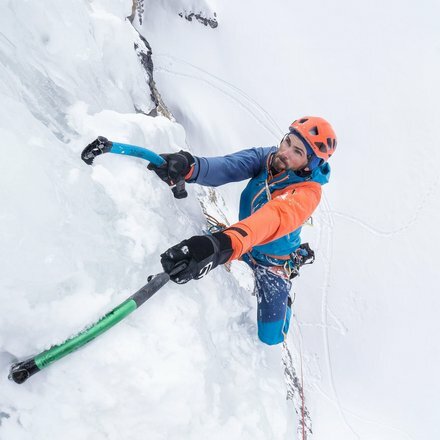 The 'Pinnistal' isn’t just home to a strange name, despite not well known as one of the best ice climbing locations, it’s an Eldorado for ice climbers! The long approach can definitely act as a deterrent for those who aren’t totally motivated! 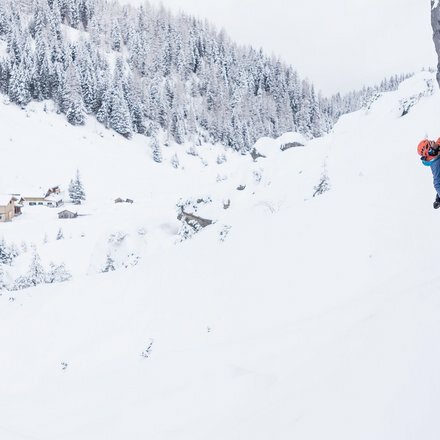 This valley – accessed via the prominent Stubai Valley – is home to impressive cliffs is the geographical collision point of two different types of rock. Standing in the valley, if you look left, you are greeting by imposing limestone cliffs. The ‘Abbrüche’ of the so-called Kirchdachspitzen tower more than 600 Meters, and the Ilmspitzen, lying behind, is something that one would expect to find in the Dolomites! In contrast, looking to the right you see ‚Urgestein‘ and lush green fields. This trip, we stick to the steep walls on the left side of the valley. In this case, ‘we’ refers to the ice climbers and athletes who came together for the AUSTRIALPIN team meeting. We meet on Friday in the beginning of February and are greeted by top conditions and cold temperatures. Coming together are Harald Berger, Roli Striemitzer, Benni Hangl, Cathy Laflamme, Mark Oberlechner, Matthias Wurzer, Christian Piccolruaz and Peter Manhartsberger as Photographer. 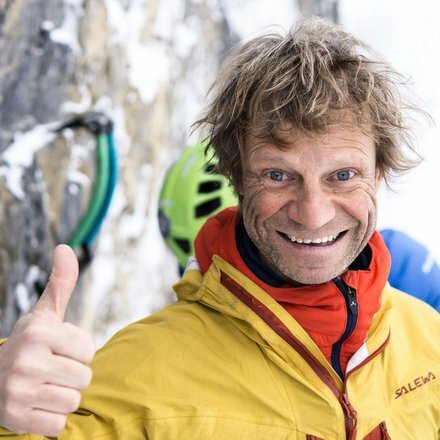 On the first day the mixed route „Feuerzeug“ (M8- WI5+), was climbed, a free standing stalactite, that requires ideal conditions in order to be possible. It is located left of the more well-known route ‚der Kerze‘ and offers only poor protection on old pitons for it’s 20m. 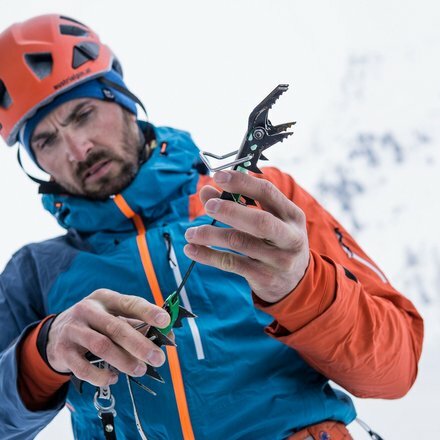 Once you reach the ice, ice screws are taboo, as the risk that the ice collapses- taking any screws with it- is too high. The „Kerze“ (WI 6-) was also climbed from some team members. 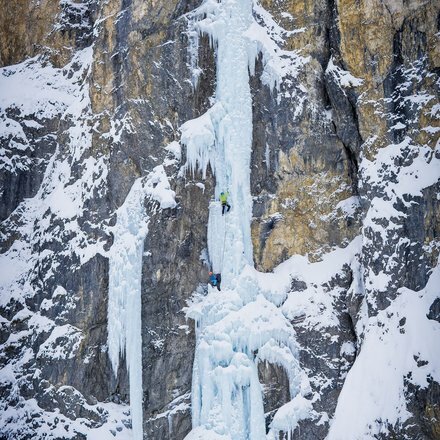 As it was ‘picked out’ from a busy season, it was significantly easier, and the entire 55m of vertical ice could be simply enjoyed. In the even we met at the Pinnisalm to relax, warm up with a drink, and give feedback to our new AustriAlpin equiptment. In the hands of Christian, the owner of the Alm, we were well taken care of. 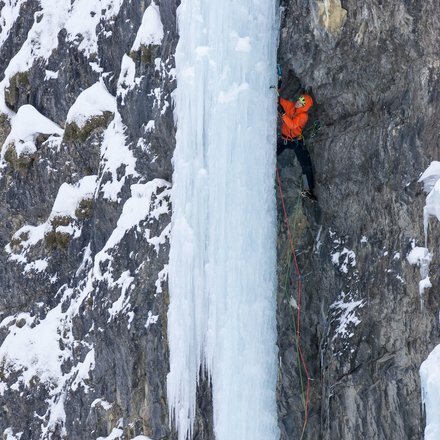 The next day the new route „Iceman“ (M8 WI5), (which Picco established just 2 weeks before) was on the to-do list. To the right of the route Rumpelkammer this route has technical moves on rock and climbs up free hanging ice. In total it involves 4 short, varied pitches, each with contact on ice, ad with a grade of M6-M8. 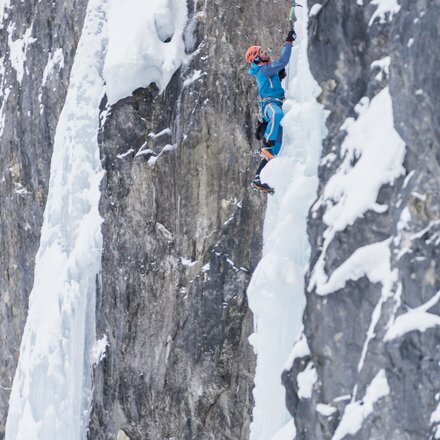 Thin ice, a trick traverse, a steep crux pitch all topped off with a cool final pitch. 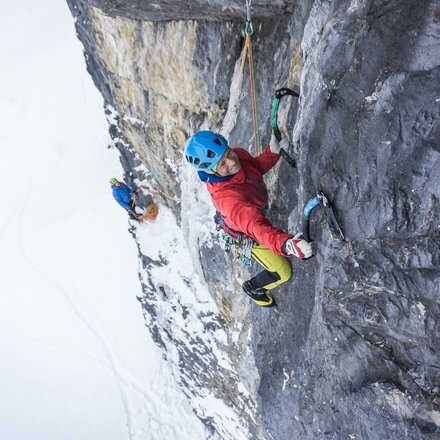 We also climbed the routes Rumpelkammer and Klein aber Fein, rounding out two great days in ice! More info concerning the routes can be found here: www.piccolruaz.at.